I loved the look of this USA Afghan when I found the free pattern on lionsbrand.com. It calls for a size P crochet hook but I used size N. I also made 30 panels instead of 9, crocheted them together per these instructions and then I added a double crochet border around the edge. This is gorgeous! 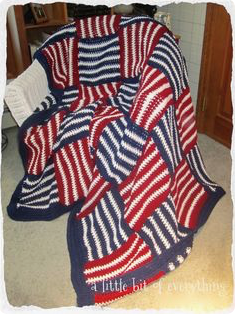 You did an excellent job w/this afghan! Visiting today from Freedom Fridays. Hum... An afghan. Maybe I need to make an afghan? One of the problems with joining up with the blogging community is seeing what everyone else is up to and wanting to do it too. I like your afghan a lot. It looks cozy and warm and pretty. This is really beautiful! My mother-in-law has made my children some really stunning things...she would love this! Cosy, bright and beautiful! Adore it! That a beautiful blanket and I love how it matches the colors on your blog! You always make me want to learn to knit and crochet! Thanks so much for linking up to Making Your Home Sing Monday! What a beautiful afghan! Great work! that is so lovely! Wonderful! I love it! The pattern is really fun. You did a great job. thanks for sharing for Share Your Cup. The design is nice and simple but it rocks. Hi, I’m Anne from Life on the Funny Farm (http://annesfunnyfarm.blogspot.com). These are so cute! Very clever. Thanks for linking this up with the MMM!